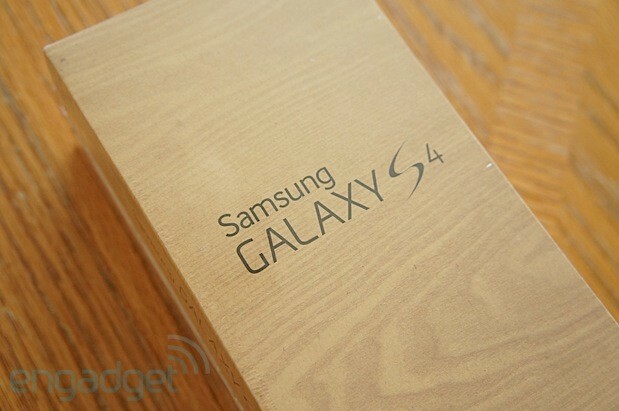 Samsung Galaxy S 4 with Exynos Octa-core: what's different? 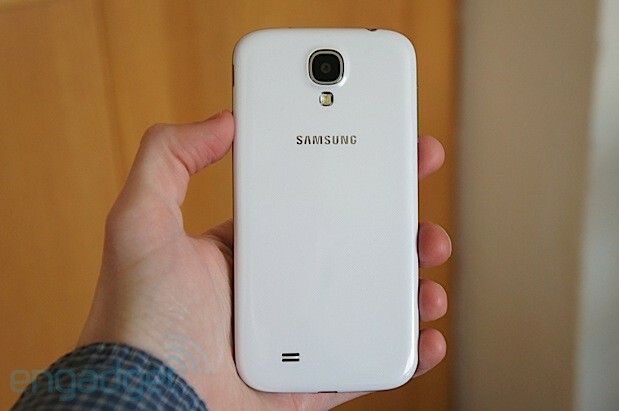 Samsung's latest flagship, the Galaxy S 4, comes in two distinct flavors -- and they're both good. One uses the much-hyped Exynos Octa-core chip, while its identical twin takes advantage of the quad-core Qualcomm Snapdragon 600. In either case, the availability depends on where you live: the Exynos-powered I9500 is difficult to find in North America (at least for now), but our friends at Negri Electronics, an online retailer currently stocking the Octa-core device, gave us the opportunity to play with a unit for a few days. During our time with the device, we were able to get a solid feel for how this particular version of Samsung's flagship compares to the Snapdragon 600-powered model. So how does it hold up against its Qualcomm brother in terms of performance and battery life? Read on to find out. The Exynos-powered GS4 is just as excellent as the Snapdragon 600 variant, with slightly better performance. However, the lack of LTE will be a dealbreaker for some. Unless you pop open the back and look very closely at the intricate antenna setup, you're not going to see any difference between this and the other GS4 variant. Though the boards inside the two models are drastically different, Samsung has been able to maintain the same design in nearly every other respect. The battery covers and chargers are interchangeable, so you don't need to worry about incompatible accessories. Indeed, the real story lies underneath the hood. The phone can essentially be broken down into four basic models: the GT-I9500, which sports the brand-new Exynos 5 Octa 5410 chipset clocked at 1.6GHz, along with a dual-SIM I9502 for China that offers the same specs; the SHV-E300, a Korea-specific version that uses the same chip clocked at 1.8GHz; and the I9505, which uses Qualcomm's Snapdragon 600 (APQ8064T) at 1.9GHz. 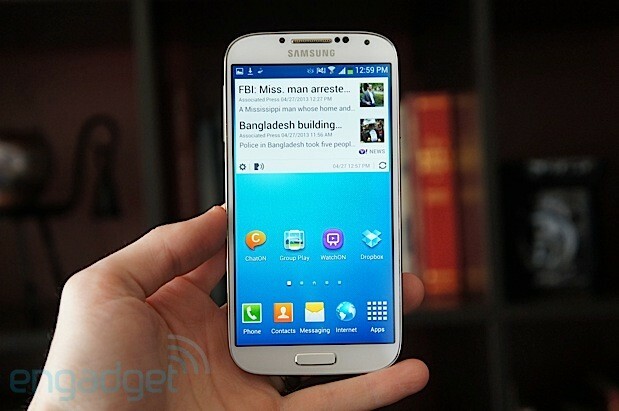 At the time of writing, the latter model is the only option if you purchase the GS4 through a carrier in North America. The Korean flavor has escaped our critical eye, but you'll be able to grab one on any of the three major operators in South Korea. Fortunately, we recently had the opportunity to play with the I9500, a phone that has been largely kept out of the spotlight until now. If you can't part with LTE, the I9500 isn't going to be of interest. Before we dive into specifics on the processor and its performance, let's note that your purchase decision may be influenced by your interest in LTE. 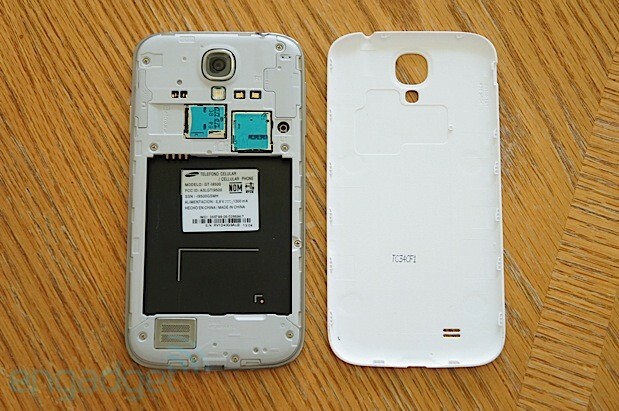 The I9500 is resigned to using quad-band HSPA+ (850 / 900 / 1900 / 2100) and quad-band GSM / EDGE (850 / 900 / 1800 / 1900), despite the fact that the Exynos 5410 has a radio capable of supporting up to 20 different global LTE frequencies. Only Korea's SHV-E300 actually offers any compatibility with the faster tech -- and it's likely only going to serve you well in Asia. For US users, this means your only LTE option is to choose from the Snapdragon 600-powered devices used on all seven networks that carry the device. That's bad news for many folks who may be hoping to buy an unlocked Exynos model with compatible LTE. Aside from these technicalities, the rest of the featured components are exactly the same in both models. You'll still have the same 5-inch 1080p Super AMOLED panel, 2,600mAh battery, 2GB of RAM, MHL 2.0, 13MP rear camera and 2MP front-facing cam as before. Our particular unit came with 16GB of internal storage, but just like on the Snapdragon version, it only offered around 9GB of usable space. The Galaxy S 4 is the first Samsung device to feature its homegrown Exynos 5 Octa 5410 chip, which -- as its name implies -- is an eight-core CPU with an Imagination Technologies PowerVR SGX 544MP3 GPU and 2GB of LPDDR3 RAM. Since it's important to understand exactly what all this means if you're trying to decide which model to buy, let's discuss how this chipset is designed. The 5410's eight processing cores are set up in ARM's trademarked big.LITTLE architecture style: it has four energy-efficient Cortex-A7 cores for lighter tasks, along with four high-performance Cortex-A15 cores that are designed to kick in for duties that require more processing power. Jobs that tax the processor up to 1.2GHz will be taken on by the A7s, but the A15s will turn on (shutting off the A7 cores in the process) as soon as more power is needed. This structure is very similar to Tegra 3's "4-PLUS-1" Companion Core in concept, though you get four total cores, all of which are capable of operating as low as 200MHz. In theory, having multiple cores dedicated to running basic tasks at lower clock speeds should make the device more power efficient. Branding the chip as "octa-core" is technically accurate, but a little misleading to users -- it may lead people to think they're getting significantly more power than on quad-core devices, but in reality, you'll only see four cores working at a time. Since your top performance will involve four Cortex-A15 cores, you'll still have the best processor you can currently get on a smartphone, but the idea that you're getting eight cores running at the same time doesn't hold true. On the GPU front, this new Exynos chip sheds the MaliMP of old and opts instead for a three-core Imagination Technologies PowerVR SGX 544MP3 clocked at 533MHz. In terms of overall speed, this is higher than the 450MHz Adreno 320 that comes with the Qualcomm-powered GS4 and the 400MHz version on the HTC One. Unfortunately, the chip itself isn't necessarily bleeding-edge, per se: it's still one of the best smartphone GPUs you can buy, but for comparison, its specs suggest that it lands somewhere in-between the third- and fourth-generation iPads, which also use PowerVR components for their graphics. This isn't a dealbreaker, of course, and will only serve to be a minor letdown even to the most dedicated mobile gamers. When we reviewed the Snapdragon 600-powered GS4, one of our biggest questions was how the Exynos 5 model would actually compare in both performance and battery life. With so many other similarities between models, the processor architecture of both versions has been one of the biggest uncertainties to us. It turns out, however, that they aren't as different as we originally expected. While we only include a handpicked selection of six benchmark tests in our standard reviews, we went a little overboard for this article because performance is such a key factor when comparing the Snapdragon and Exynos chips. What you see below is a rather comprehensive list of tests, just to get an even more solid idea of how well the two devices fared against each other. SunSpider: lower scores are better; Linpack scores equal an average of 10 results. As you can see, the multitude of benchmark tests indicates a rather mixed bag of results; roughly half of the CPU tests favored the Exynos 5, while the same could be said about gaming. It did, however, beat out its Snapdragon counterpart in web browsing and HTML5 tests. It also bested both S600 devices (GS4 and HTC One) in seven out of the 12 tests. Outside of the web-based scores, we weren't able to draw any conclusive evidence that indicated one version was better than the other. Real-life usage seemed to reflect the benchmarks in this sense, as well, although we felt that the Exynos version held a slight advantage over the Snapdragon. If you recall, we noted in our GS4 review that the T-Mobile unit we used suffered from some visible lagging and stuttering when Samsung's smart features and motion gestures were activated, although it was smooth sailing as soon as we turned them off. Fortunately, we couldn't replicate the same problems on the I9500, as it appeared to do a better job handling the processor-heavy load. Aside from this, however, the two devices fared almost identically when put side by side in various scenarios ranging from light everyday tasks up to graphic-intensive games. The battery is better than average, but still not quite as good as the Snapdragon-powered GS4. Our initial battery life tests surprised us. The big.LITTLE setup on the Exynos is designed to improve power efficiency, but Qualcomm's offering still appears to have a slight edge in our video rundown tests and real-life usage. In the former, which is our standard endurance test that runs HD video on an endless loop, the I9500 lasted for nearly eight hours. While this is still better than average compared to other phones -- the global HTC One, for instance, only made it six and a half hours -- it's noticeably worse than the Snapdragon-powered GS4, which came in at nine hours and 15 minutes. (As a disclaimer, both devices were using HSPA+ with at least three or more bars during our tests, so the variance may be slightly less when LTE is active on the Snapdragon version.) As for real-life use, the I9500 powered off after 12 hours of use, compared to around 15 on its counterpart. Contrary to our original expectations, the Octa-core GS4 isn't significantly faster or better than its Snapdragon sibling. Sure, it offers a small advantage in overall processor performance, but the difference isn't as obvious as we thought it would be. With that in mind, does the HSPA+-only I9500 hold any other benefits over the I9505 or its variants? You could argue about the lack of bloat or carrier influence, but that only really matters when we talk about US-specific models. Aside from that, people interested in the GS4 will enjoy the slightly improved performance on the Octa-core model. Pricewise, the I9500 is just a tad less spendy: retailers like Negri currently sell the 16GB version for around $790 ($850 for the 32GB unit and $890 for 64GB), while the unlocked I9505 adds another 10 bucks. When comparing the two devices, most differentiating factors appear to be a wash, so either way you're getting a solid device that you're likely to be happy with.